» Reviewed by William F. Deeck: A. FIELDING – The Charteris Mystery. Reviewed by William F. Deeck: A. FIELDING – The Charteris Mystery. A. FIELDING – The Charteris Mystery. Collins, UK, hardcover, 1925. Knopf, US, hardcover, 1925; A. L. Burt, US, hardcover reprint, no date. The first third of this novel made me wonder why I hadn’t discovered this author long before now. Some amusing and interesting characters and a complex crime start things off well. When a beautiful young lady is found in a quarry with a broken neck, the local M.D, and the authorities are ready to write the death off as misadventure. A few people who knew her well — and, ignoring their knowledge, liked her — have doubts about the death being an accident. Despite his being a master of disguise and coming to the case as fully equipped as Dr. Thorndike, Chief Inspector Pointer is an acceptable investigator. Called in unofficially, he discovers that the girl’s demise was a homicide. From this point, the book deteriorates into a thriller with too much unlikely melodrama. I’1l try another Fielding novel, even one featuring Pointer, but I’1l have my fingers crossed. — From The MYSTERY FANcier, Vol. 12, No. 2, Spring 1990. Editorial Comment: The name behind the “A. Fielding” byline was a subject of several posts on this blog when it first started. The current consensus seems to be that her real identity was one Dorothy Feilding, 1884-? You may use the search box over in the right hand column, or go here for the single post that summarizes the discussion the best. 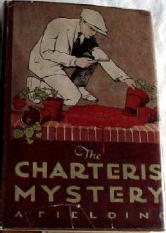 The one question that Bill’s review does not answer but the one I’d like to learn more about the most, is exactly where does “Charteris” come in? Actually, Charteris (Charters) is a common name in England, though most of them are neither saintly nor half Chinese.